We have interesting characters from all corners of the globe and from all walks of life, wearing beautiful costumes and masks that hide their true identities. We also have great displays of exotic animals, new technologies, theater and circus acts. We have unimaginable displays of wealth — and plenty of people all too willing to release the wealthy of this burden. We have secret meetings, high-level talk and political intrigue. Noblemen acting less than noble under the cover of anonymity and a lower class freely intermingling with the rich and powerful… You get the picture. So how come then, that the Venetian Carnival is curiously absent from the steampunk ethos? In this article, we will discuss the history of the carnival, from its earliest roots in the twelfth century to its demise in the late-eighteenth up to the resurgence of the festival in our own times. There is some debate on when, where and how the tradition of the carnival emerged. The earliest mentioning of a carnival dates back all the way to the year 1092, when it was associated with the Catholic celebration of Lent. However, it appears that the modern carnival originated in the year 1162. In this year, Duke Vitale Michiele of Venice defeated Duke Ulrich II of Treven. The battle proved to be a milestone in Venetian history and has been celebrated annually since. Duke Ulrich II was captured during the skirmish and released on the condition that he would pay a tribute to the republic: every year, he was to donate twelve loaves of bread, twelve pigs and a bull. 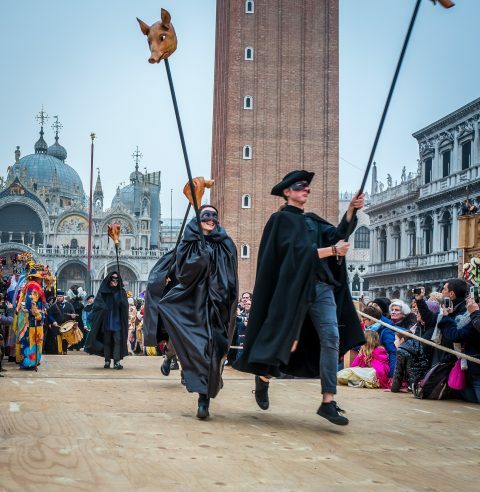 In the years to follow, the festivities commemorating the victory would commence with the slaughter of the bull, which represented Ulrich, and the twelve pigs on the San Marco Square. The first recorded mention of the famous masks dates from the latter half of the thirteenth century. In May 1268, the city council prohibited a new “sport” that had developed during the festivities — masked young men had begun throwing scented eggs at the ladies. This also marked the beginning of centuries of ever-increasingly severe attempts to curb the festivities to manageable proportions. The city council cited worries about the population’s “moral decline” as reason to keep the carnival under control. Apparently, the celebration got out of hand on more than a few occasions, as reflected by the increasingly tough laws. In 1339, a law was passed prohibiting the wearing of masks in public at night in an attempt to curb petty crime and lewd behavior. In 1458, a law prohibited men from dressing up as women and enter convents to stir up trouble. A similar law came in effect in 1603, yet another measure to restore peace and quiet in the convents. At various points in history, laws were enacted banning the carrying of weapons or other dangerous objects or denying entrance to churches and public buildings while masked or inappropriately dressed. The year 1608 marked the start of the serious curbing of the festivities. In August that year, the city council forbade the wearing of masks altogether, except during the approved carnival period. Precisely half a century later, in 1658, the council reaffirmed the necessity of the laws that controlled the wearing of masks and banned the carrying of weapons during the carnival. At this time it also became illegal to wear masks in churches and to wear religious clothes under them. 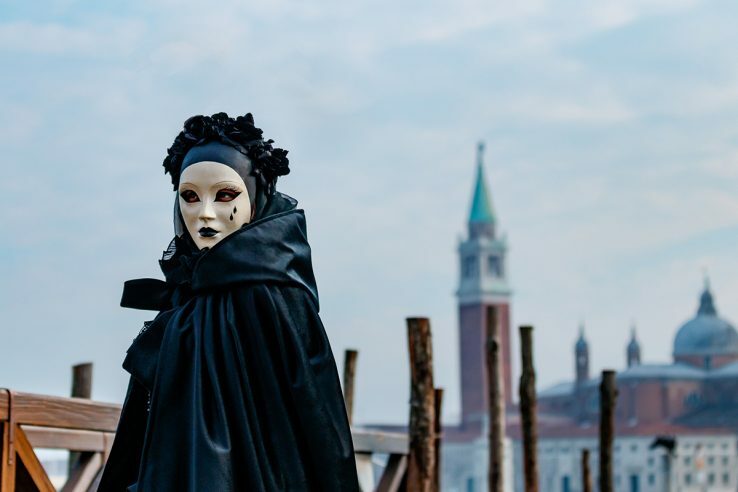 The late 1600s and early 1700s saw yet more regulation: it became illegal to wear a mask during Lent or any religious celebration that took place during the carnival. Although the council defied its citizens for years and tried repeatedly to contain the festivities, the carnival prevailed and the tradition lasted for nearly 500 years without major disruptions. This came to an abrupt halt when Venice became part of the Austrian kingdom of Lombardy-Venetia. In January 1798, the Austrians took control of the city. The new rulers outlawed the carnival and now that the city was part of a larger realm, it lost much of its stature, making the grand festival seem like something from a distant past. In the years to follow, political authority shifted many times with Venice caught in the middle of European power struggles. The once-proud republic became Austrian territory, then Italian, then Austrian again. In the late 1840s, there was a brief resurgence of sovereignty, however, it was not to last. Venice became part of Italy once more and has been so ever since. Once the political storms finally settled, and the archaic laws that had banned the carnival were lifted, the festival did not return in the same grandeur of the past. Like the city itself, the carnival was but a shadow of its former glory. Matters became worse over time, culminating in the 1930s, when the Fascists came to power in Italy and the carnival was banned again. For decades, it seemed as though the carnival would become a vague reference in the history books; a subject for scholars, forgotten by the masses. However, in the late 1970s, a number of local artisans started hand-crafting the once-famous masks and dresses once again. Stories of the carnival were retold and it did not take long for its newfound fame to spread around the world. One could argue whether or not the carnival is the same as it used to be. Has the original meaning been lost? Has commercialization taken over? Is the soul of the carnival still there? Whatever the answer may be, one thing is for certain: this time, the carnival is there to stay. Although it is sadly missing from the timeframe steampunk enthusiasts fondly refer to, this should not bother us too much. The genre is hardly constrained by historical fact and I, for one, am looking forward to the day when a steampunk’d carnival dress shows up! This story first appeared in Gatehouse Gazette #3 (November 2008), p. 11-12, with the headline “Masquerade: The Venetian Carnival”.